Welcome back to the third and final part of Kimberly Rae‘s series about recognizing and preventing sexual abuse. 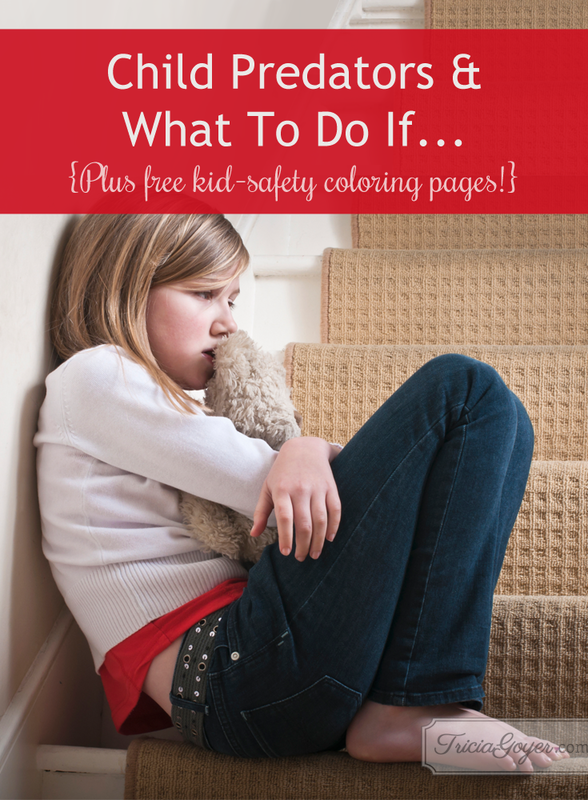 Learn more and purchase a copy of Kimberly’s coloring book, I Am Safe, and companion book at her website. Keep reading to find out how you can download a few FREE pages below! 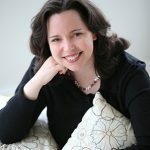 I have heard so many, many stories from people who as children faced situations they knew were wrong but did not know what to do, and so often the adults also did not know what to do, and so they did nothing or did the wrong thing, adding to the child’s confusion, shame, and vulnerability to future exploitation. I can’t express how much I want this to stop. How important it is that children are empowered to know that when something is wrong, they have options and what those options are. To understand that sexual abuse is a crime and should be treated as such. Child predators can’t be recognized by race, gender, or any other obvious visual sign. They do, however, follow a pattern of behavior that we can learn to recognize. Predators groom potential victims. 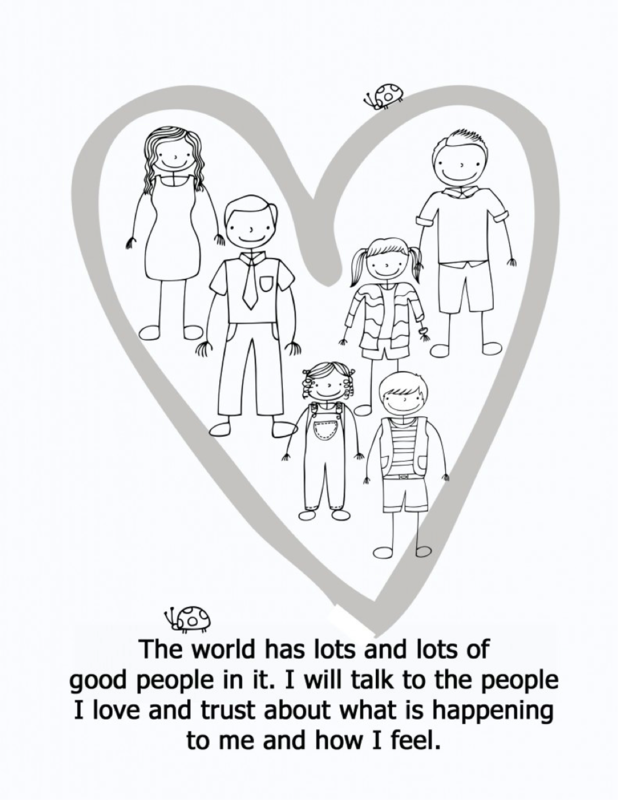 Much of the following is addressed in I AM SAFE adult’s companion. There are many reasons a victim may remain silent, but oftentimes it is because the predator is manipulating them emotionally, holding something over them such as shame (that they feed), or keeping them afraid with threats. 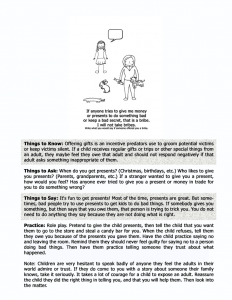 Threats and bribes are difficult concepts to explain to children, so I’m hoping the following will help. Below you’ll find more information, statistics, and things you can teach your children on pages from I AM SAFE’s adult companion book. One problem I’ve found is that sometimes, even if we teach children the boundaries between appropriate and inappropriate behavior, we fail to finish the training by teaching them what to do if that boundary is crossed. A child may recognize that what someone is doing is wrong, but they do not know how to respond. Children are hesitant to resist adults, especially if that adult is trusted by their family, or if they are raised in a family like mine where authority figures are to be obeyed. This training lets children know that a person who does bad things should not be obeyed. It also teaches children that people who do bad thing lie, and even if they say something is the child’s fault, it is not true and should not be kept a secret. Predators groom victims. They might “accidentally” walk in on a child changing, or “accidentally” touch a child’s private areas. Sleepovers are prime opportunities for predators to get a child in an isolated situation and cross boundaries. (In 40% of childhood sexual abuse cases, the child is abused by older or more powerful children.) 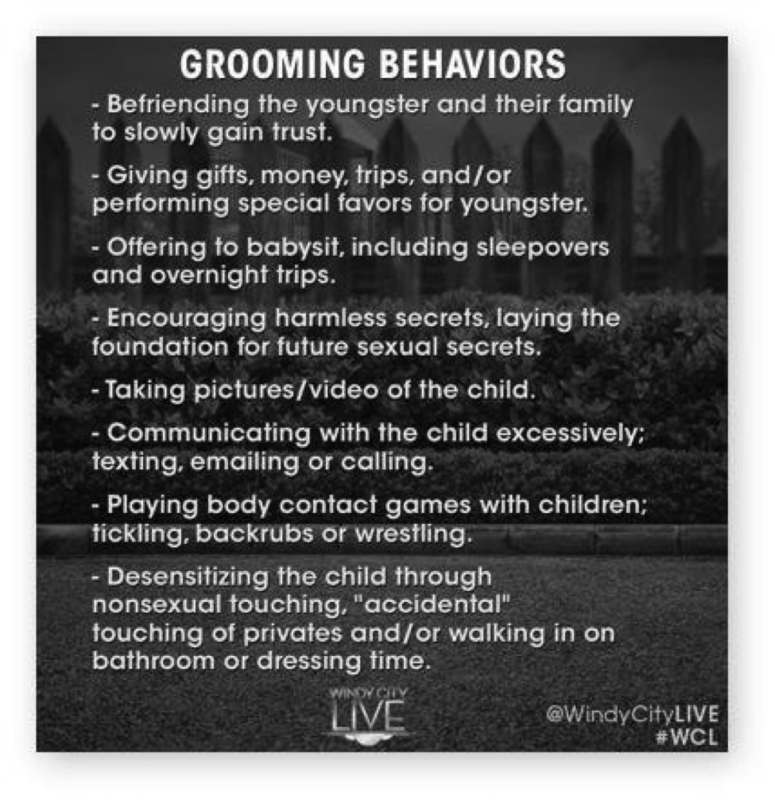 A predator might even seek to meet the child’s social and emotional needs, so the child becomes emotionally dependent and less able to distinguish boundaries due to a falsified understanding of a loving relationship. If a child does come to you with a story of sexual abuse, this is a huge expression of trust. Reassure the child that they are very brave to come and tell you. Gently ask for more details about what happened, but don’t rush the child to tell you everything. (It may take awhile for them to fully open up, so leave spaces of silence.) Tell the child you believe him or her and are going to help them, and be sure to do so. If 1 in every 4 women carries the secrets of childhood abuse, it’s likely that there are women in our circles who still bear the pain of those memories. Wouldn’t it be wonderful if, thanks to education, awareness, and resources like I AM SAFE, we could change that statistic for the next generation? 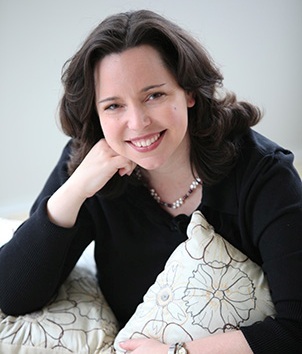 Award-winning author of 20 books, Kimberly Rae loves to write and train on how God’s people can fight human trafficking. Her series of suspense/romance novels (Stolen Woman, Stolen Child, Stolen Future) are all Amazon bestsellers. Rae also has a series for teens and pre-teens (Capturing Jasmina, Buying Samir, Seeking Mother) presenting modern-day slavery in an age-appropriate way. 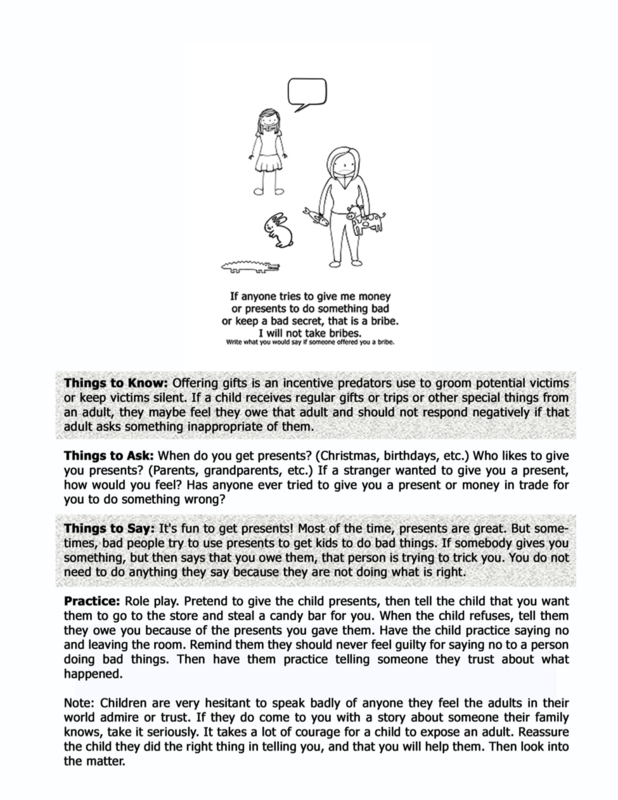 Get printable handouts on trafficking or find out more at www.kimberlyrae.com.